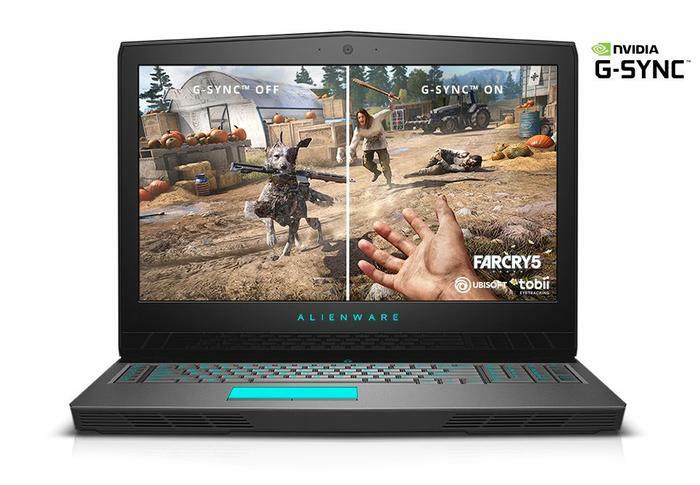 The latest Alienware 17 might be the most Alienware gaming laptop Alienware have shipped out to Alienware customers in quite a while. It doesn’t reinvent the wheel, but it does live up the brand’s legacy in all the right ways. After all, Alienware basically invented - or at the very least popularised - the neon-lit-glowy-death-machine status quo that now dominates the gaming laptop space. It’s not really a surprise that they play that same card here - and they play it well. What is a little surprising, however, is just how competitive the Alienware 17 R5 is for performance. Even if the broad-strokes blueprint for the Alienware 17 is a little predictable, it’s not necessarily unlikable. If you say the words Alienware gaming laptop aloud, this is probably pretty close to the machine you’re thinking of. It’s big and bulky. It’s silver, black and whatever shade of RGB lighting takes your fancy. It’s got the specs to compete with even the big guns on the desktop PC space, courtesy of an Nvidia GeForce GTX 1080 graphics card and an Intel i9 processor. As with most recent Alienware products, the Alienware 17 doesn’t lean too heavily on customizable lighting as a feature. It’s present - but it’s relatively low-key compared to some of the other heavy hitter gaming laptops out there. Unfortunately, the back-end of the laptop isn’t quite as subtle. This end of the Alienware 15 is jam-packed with heat vents that add further bulk to an already considerable physical footprint. One small detail worth calling out here is the trackpad. It comes with a soft, moody-looking underlight and also sits just off the center of the laptop. Though this detail initially comes across as a bit odd, it ends up making the experience as a whole lot more ergonomic. The Alienware 17 R5 also opts to incorporate both haptic sensors and physical buttons - which feels like savvy call by Alienware. To sum things up: there’s not really been any effort to change up or distill down the experience here. It’s technically better - but it’s not meaningfully different. All the same, that’s not really surprising conclusion to draw here. Alienware know who their audience is. They know what their expectations are. The new Alienware 17 is just the next logical step to everything they’ve done prior, with all the bells and whistles you’d expect. 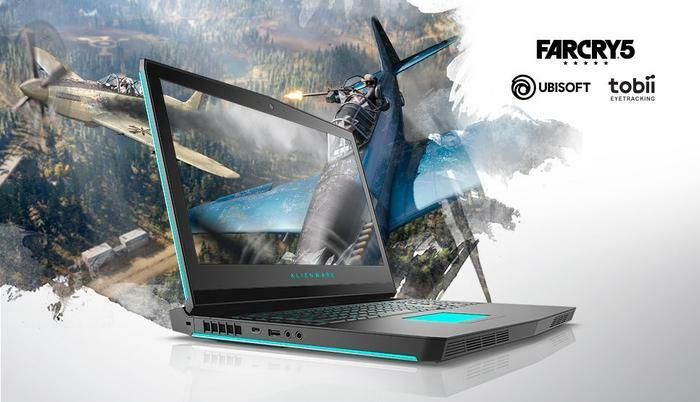 The past, we’ve usually come away pretty impressed with the output on Alienware’s gaming laptops but their tendency to offer the kind of high-polish design the brand is known for often saw them lose a bit of ground when it came to raw performance. There are plenty of other gaming notebook brands out there that aren’t afraid to get a little messy in their dogged pursuit of desktop-level performance. Alienware hasn’t usually been one of them. Until now. 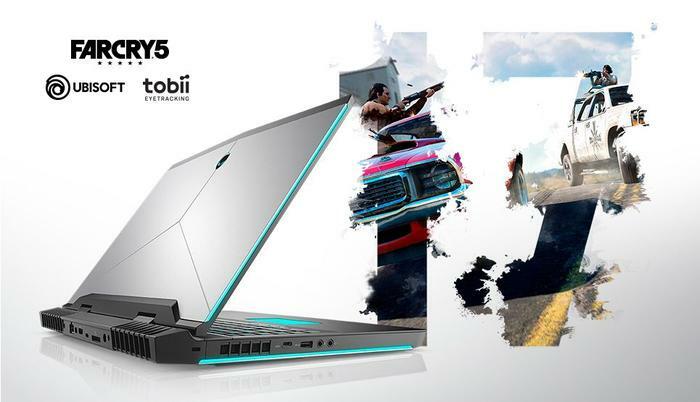 With the Alienware 17 R5, the gaming space’s most mature notebook brand comes out swinging. Equipped with Intel’s first uber-performance Core i9 laptop chip, the Alienware 17 R5 delivered impressive results that are, at least at the time of writing, second to none. I don’t want to overstate it but the Alienware 17 R5 might be the most overkill gaming laptop I’ve ever had the pleasure of trying out. The Alienware 17 R5 managed Middle-Earth: Shadow of War on the highest possible settings with between 80 and 100 frames-per-second. As for Total War: Warhammer 2, the Alienware 17 R5 scored a steady 74.4 FPS on the battle benchmark, 81.7 FPS on the map benchmark and 59.3 FPS on the skaven benchmark. Even the mighty Kingdom Come: Deliverance couldn’t get the Alienware 17 R5 to miss a beat. With the game’s graphical settings cranked so high it gave us a warning, it never dipped below 60 FPS. If there’s a game out there that this laptop can’t run with a steady 60 FPS, I don’t know what it is. If you do, fear not. You can always use the revamped Alienware Command Center app to tweak the tuning of your CPU and GPU and push the performance of the Alienware 17 R5 even further. But bear in mind that the above experiences were all achieved without doing so. And when it came to benchmarks, it didn’t let up either. 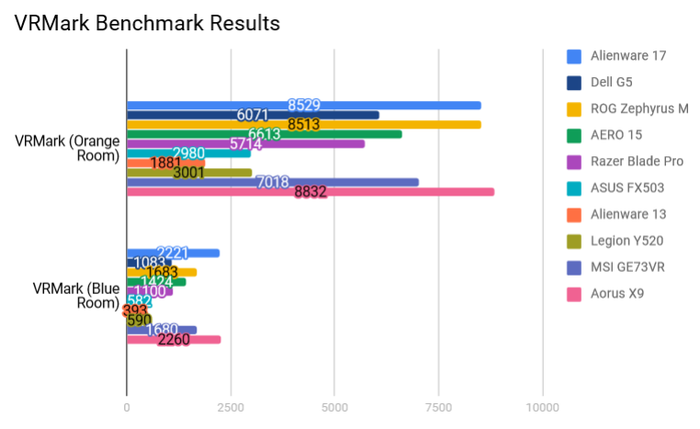 PCMark’s Work test saw it come out on top - beating ROG’s Zephyrus M, the Dell G5, Gigabyte’s AERO 15 and the new Razer Blade Pro. 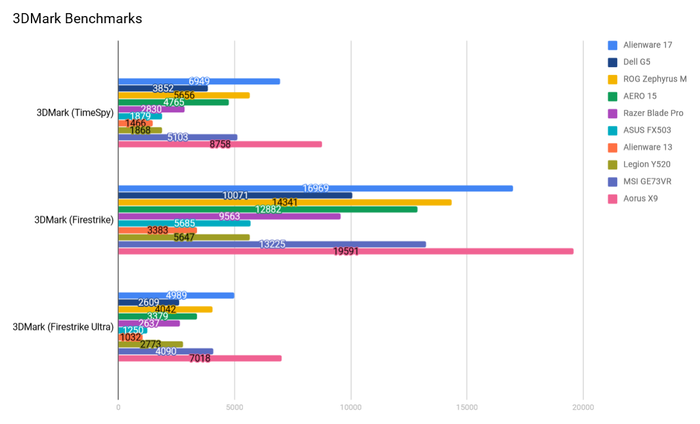 Then, when it came to 3DMark, the Alienware 17 R5 continued to dominate. We found it second only to Gigabyte’s own impressive Aorus X9. After running it through the VRMark testing suite, we’re pretty much ready to call it day on this one. The ROG Zephyrus M runs a close runner up but the numbers here leave us with the distinct feeling that Alienware 17 Pro might be one of the best gaming laptops money can buy right now. 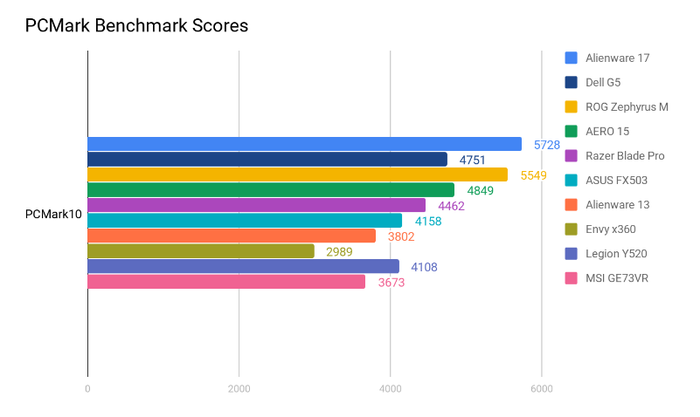 Again, when it comes down to the raw, numerical business of benchmarking, the Alienware 17 R5 is second only to the Aorus X9. However, whether you should look at buying one right now might be another question entirely. Yes, if you’re after the absolute best and most-beastly gaming laptop out there, it’s truly difficult to look past the Aorus X9. 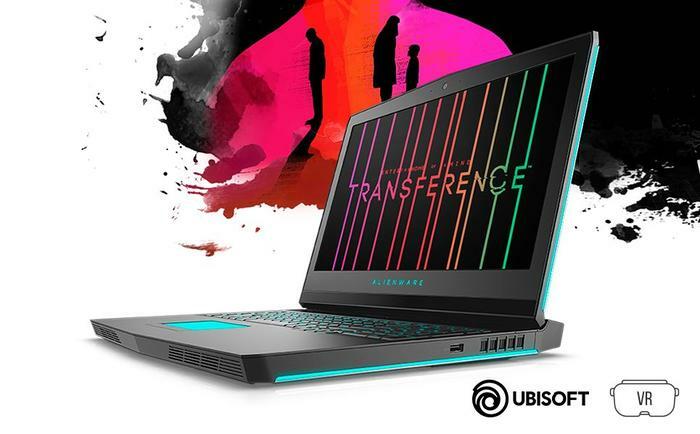 It’s the only gaming laptop that can keep pace with this thing and, given the superior performance and the lack of a meaningful difference in price, an fairly straightforward alternative to what Alienware are offering here. Still, if you’re already over the mental hurdle of spending five grand on a laptop, rest assured, this is one of the best you’ll be able to find. It melds top notch perform with the incredible polish and design Alienware are known for and while that ends up being a pretty predictable formula, it’s not one without merit and payoff. The Alienware 17 R5 embodies the prototypical Alienware experience, written in the boldest font imaginable.